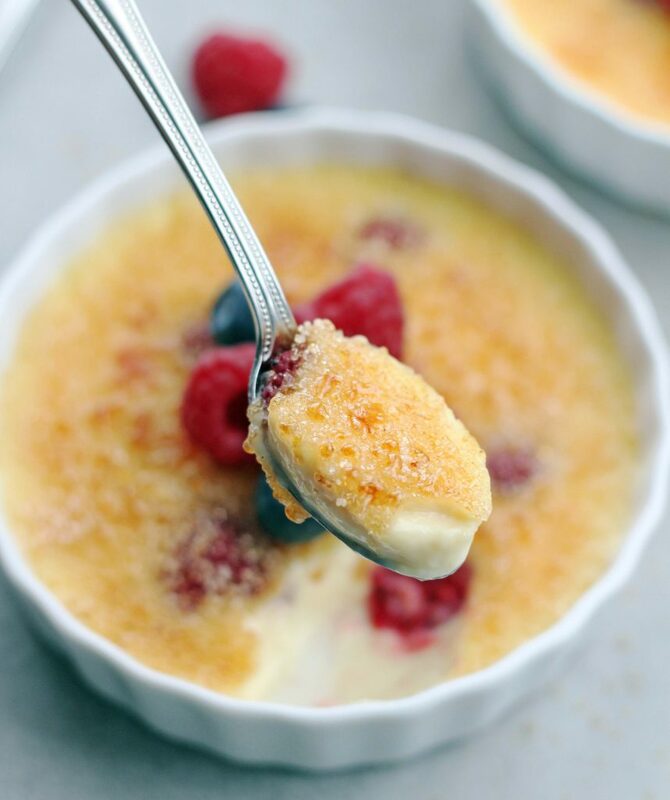 Simple, elegant, and incredibly delicious this Raspberry Crème Brûlée is the absolute perfect ending to any meal. You will be in love with this! Crème brûlée, does it totally intimidate you? Does the thought of using a kitchen torch terrify you? Well if it does, it shouldn’t. This stuff is so incredibly easy to make and the whole torch thing is easy peasy. This is such a phenomenal dessert! I could eat it every day. It’s light, smooth, silky, rich and utterly divine. After making it just once you’ll see how truly simple it is to make. As if crème brûlée wasn’t incredible enough as is, I went ahead and added some fresh raspberries, thus making it Raspberry Crème Brûlée. It’s pretty amazing. I haven’t had or made Crème Brûlée for awhile and then my friend brought it for dessert for a dinner party I hosted over the holidays. One bite very quickly reminded me how much I love the stuff. Now there is one thing that is a must for this recipe. Promise me you will use pure vanilla and not that imitation junk you might have in your cupboard (I can say that because I actually have some sitting in my cupboard, not sure why because I never use it). Pure vanilla makes all the difference in the world. Just look at that caramelized sugar. . .it’s such a beautiful thing and it tastes as good as it looks. The crunchy, caramelized sugar along with the the decadent, velvety cream is truly one of the most heavenly things you will eat in the history of ever! You certainly can leave the raspberries out, but I’m not sure why you’d want to. But I guess if you’re completely anti-raspberry like my Braydon is, then I’ll forgive you. 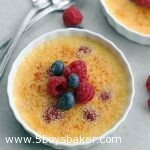 This recipe will make 6 creme brulees using this size ramekin, which is what I use. If you have the smaller, deeper ramekins like this, then you will get more than 6 servings, probably closer to 10. 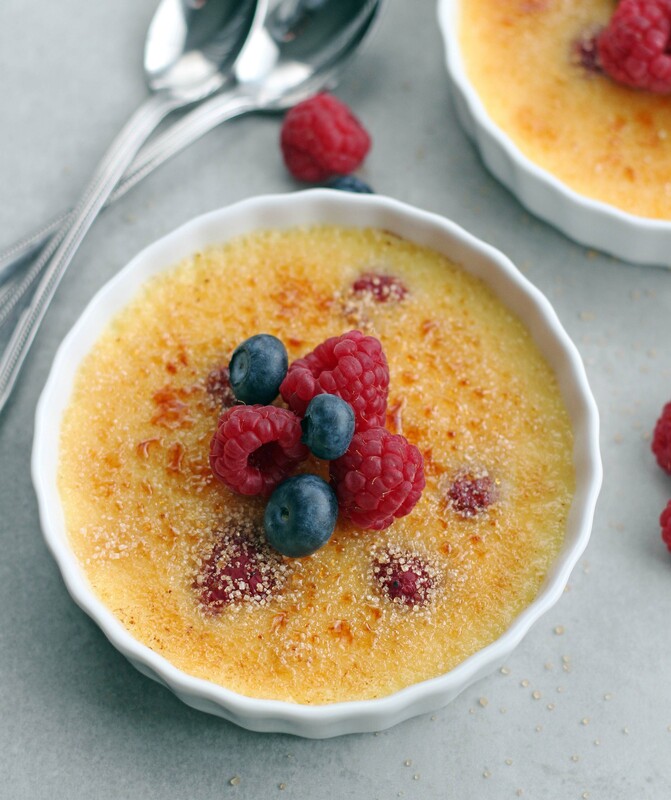 Using a creme brulee torch is definitely the easiest way to caramelize the sugar, but you can do it under a broiler if you don't have a torch. You can certainly leave the raspberries out of these if you'd like. I left one without raspberries because my picky, picky, Braydon doesn't like raspberries (gasp!!). Center a rack in the oven and preheat the oven to 300 degrees. 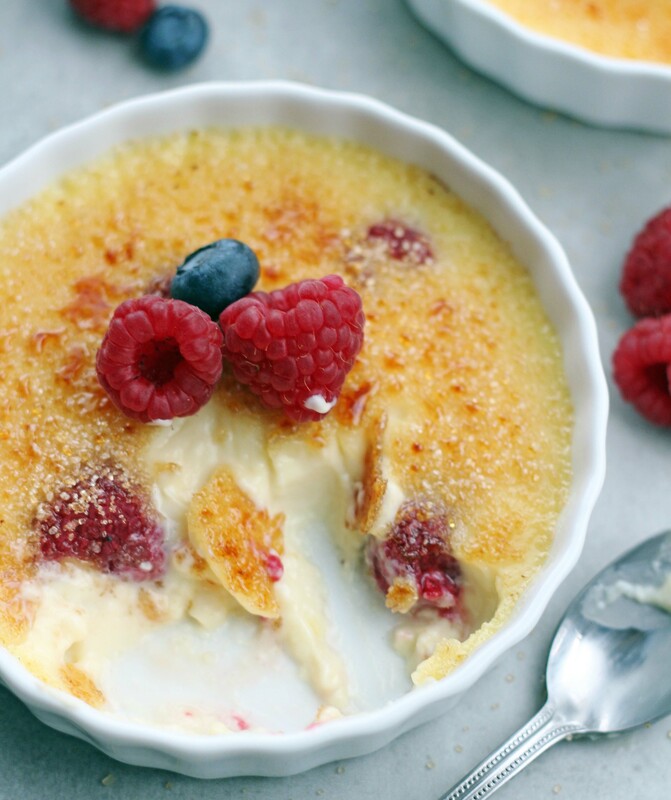 Place 6 ramekin dishes in a large roasting pan or on a jelly roll baking sheet, place 5 to 6 raspberries on the bottom of each dish. Set aside. In a medium saucepan over medium low heat, bring the cream and milk just to a boil. In a large glass measuring cup or in a medium bowl, whisk the egg yolks, sugar and vanilla together until well blended. Still whisking, drizzle in about one quarter or the hot liquid (this will temper the yolks so they won't curdle). Continue whisking while slowly pouring in the remainder of the cream mixture. Gently tap the bowl on the counter to get any air bubbles out of the custard, then pour it into the baking dishes, filing them 3/4 full. Pour enough water into the baking pan to come up 1/4 way up the sides of the ramekins. Bake the custards for 50-60 minutes, or until the custards are set (tap the sides of the dishes, and the custards should hold firm. Lift the dishes onto a cooling rack and let the custards cool until they reach room temperature. Cover each custard with plastic wrap and refrigerate for at least 3 hours, preferably longer. (The custards can be kept in the refrigerator for up to 2 days.) For the sugar to be successfully caramelized, the custards need to be thoroughly chilled. To caramelize the sugar topping with a blowtorch, work on one dish at a time. Sprinkle the top of each custard evenly with sugar - about 1 tablespoon for each dish, then brown the sugar, cooking until it bubbles and colors. To caramelize the sugar in a broiler, preheat the broiler and fill a shallow roasting pan with the ice cubes. Sprinkle the custards with the sugar, put the baking dishes on the bed of ice and run the custards under the broiler. Don't move away from your oven, depending on your broiler, it can take just seconds. When the sugar bubbles and browns, pull the custards out, remove them from their ice bed and let them settle down before serving.